2. Upper case lower case match up. 3. Letter and sound match up. You can download it for free by signing up to my e-zine. As an actively working early childhood teacher and a parent of two young boys, I am up to date with the latest teaching techniques and parenting methods. With years of experience in the field I have lots of ideas for easy, creative and meaningful activities for every situation. 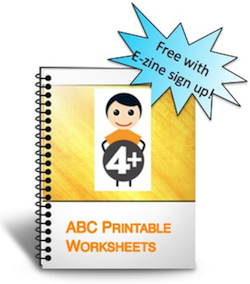 Subscribe NOW and you will receive a FREE copy of this over 130 pages printable worksheets for kids. I promise to use it only to send you The Preschooler. "Thank you Zehavit Meltzer. Your alphabet workbook is wonderful! I work as a preschool teacher for Head Start and I'm always looking for new ways to help my preschoolers enjoy learning their letters. I thank you so much for making your book available and free! I am recommending your book and site to my fellow teachers. This is a beginning of a beautiful friendship. Join our Facebook group as a way to stay up to date with our contest and free promotions.